This is the story of a person who instills fear in the hearts of the dangerous and ruthless Bodo militants in Assam. Meet Parashar, a supercop, like the ones we see in Bollywood and Hollywood blockbusters. The only difference, the person is real and she is a woman. Born in 1979, on the birthday of Mahatma Gandhi in 1979, Parashar is a superintendent of police who does not think twice to use her rifle when it comes to thwarting terrorists and saving the lives of innocent people. In the first few months of 2015, she has led from the front several missions against the terrorists, having gunned down 16 militants and leading to the arrest of more than 60 others. The mission also led to seizing tons of ammunition. Sanjukta is an IPS officer from the batch of 2006. Born in Assam and the daughter of engineer and a health services officer, Sanjukta had taken an interest in sports since her childhood, regularly participating in sporting event and parades. She is also very good in swimming. She secured the 85th rank in the All India Civil Services exam and could have chosen to be an IAS officer and spent her life in administrative services which is the first choice for most women candidates. But Parashar was a woman on a mission. She opted for IPS, instead. 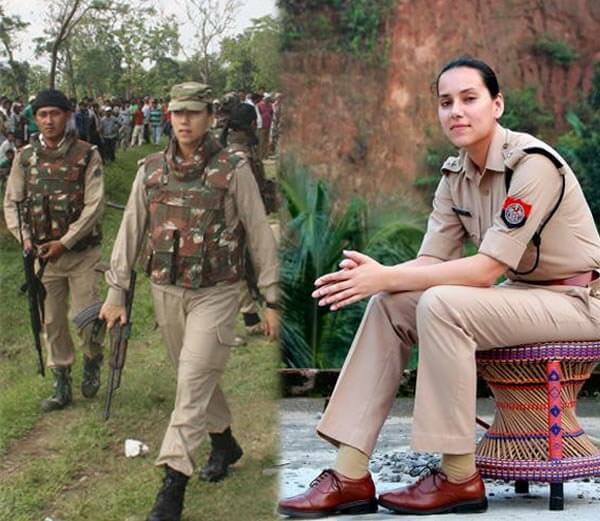 Even as the Indian Military sill does not have women in combat roles, here is this woman who leads from the front battalions of Assam Police commandos and members of the CoBRA battalion of the Central Reserve Police Force (CRPF), in fighting terrorists head-on in militancy-affected areas. She takes pride in her uniform, carries an AK-47 assault rifle and plays a major role in ground gun battles with terrorists. Parashar is a woman who is devoted to her duty and her nation and she is not afraid of death. She does not know what fear is. Hours after she started her services as the assistant commander of Makum in 2008, she was called upon for duty at Udalgiri where clashes between the Bodo Militants and illegal immigrants from Bangladesh had broken out. It was her first experience of fighting militants in a violence-torn area. Parashar is married to an IPS officer from Assam and is posted in Sonitpur, about 350 km away from where her husband is posted. They get to meet only after weeks or months and her mother takes care of their five-year-old son. Leading a battle against the terrorist from the front, again and again, is no mean feat. Neither is being the most badass woman officer in the Indian Police forces after Kiran Bedi. However, behind her AK-47 wielding avatar is a simple and humble woman who says that only criminals should be scared of her, not people from her state, whom she has made her life’s mission to serve. She has received several threats on her life from the militants, but that does not deter her in any way. It is because of women like Parashar that ordinary citizens like us can feel safe and secure in our everyday lives. In India, where gender discrimination is still prevalent, Parashar is a role model not only for women but also for men. And she makes an entire nation proud.